What do you eat over the course of a couple of weeks? When do you shop? Do you make menus and shop with that in mind, or do you make up meals as you go? Who does the shopping in your house? Well, here is a little peak into what I do weekly. I make up a calendar for the week deciding what we will eat. One night of the week is "Date Night" so no meal planning necessary for that night. As I'm making up the menus I think about what I already have in the pantry, freezer and refrigerator. Items I don't have are added to the grocery list. For us, breakfast and lunch are easy... cereal/oatmeal, muffins or maybe even egg sandwiches. Lunch is usually sandwiches of some kind, leftovers from the previous dinner or soup. I don't put these items on my list because I just KNOW what to buy to keep those supplies on hand. Then it's off to the store, usually on a Sunday evening, usually with my sweet husband. We take our own bags that we've bought over the last year. They tend to hold so much more weight and because they are square bottomed, they ride in the trunk better and groceries don't wind up all over the place. The total for this week is a little high, but since there is only the 2 of us, we are able to save half of the larger meals for a future week. That really stretches the dollar and frees up my time on a busy evening getting things ready to eat. I took pictures of the receipt thinking it might be fun to make a scrapbook page with the prices. 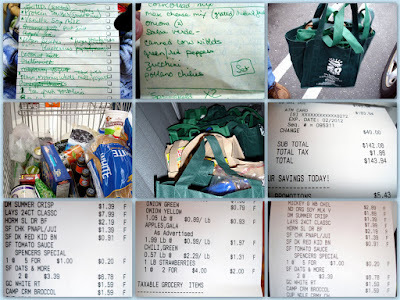 Several years from now, my grandkids might find it funny to see just how "little" we spent on groceries.